Aberfeldy is the heart in Dewar’s blended whiskies, but they also make some great single malt. This is the classic 12 year old. Malted barley, light grass and citrusy notes in the smell. Some vanilla, oak and hints of honey as well. Classic Highland whisky in the taste, yet a bit more sweet. Again I get the citrusy and grassy notes, but very fast it turns very sweet. It stays till the bitter end in the finish. Creamy dessert-like vanilla and honey sweetness. 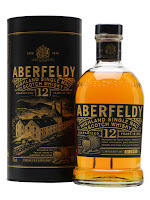 This is very easy drinking, and the sweetness combined with the low ABV could make this a great suggestion for beginners who wants to explore the Highland region. I will give this 82/100 (20/20/22/20).